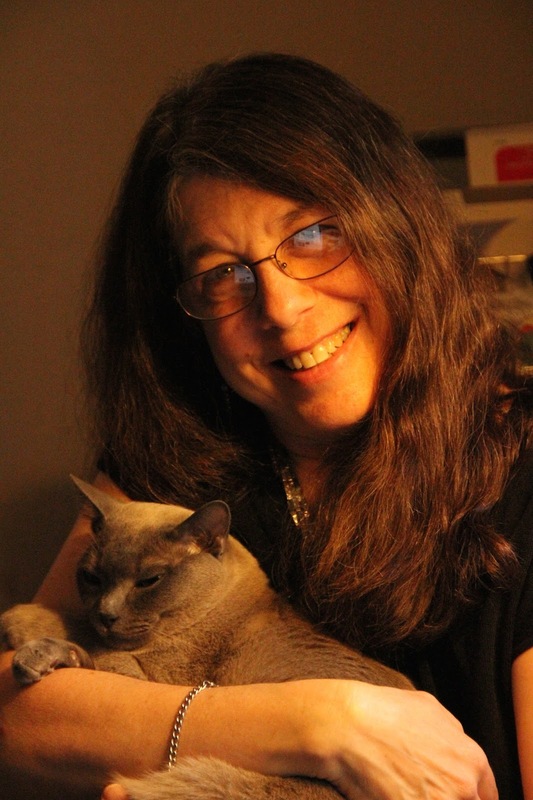 Rogue Women Writers: Does the cat die? S. Lee Manning: My Tonkinese cat, Xiao Mao - Chinese for little cat- ten pounds of sleek gray fur and energy, hates to be alone. He follows me from room to room, and when I sit down to write, read, or watch television, insists on crawling into my lap. If I dare to play the guitar, which means no lap, he climbs to the top of the cabinets and meows until I pay him the attention he thinks is his due. I ignore him, he'll leap from the floor onto my shoulder, where he'll curl around the back of myneck and purr - until I've had enough - and I dump him. He would be happy to divide his time between me and my husband, Jim, but Jim, smarter and tougher than me, goes into the living room where he works and closes the door. When I complain that leaves me the sole target of Xiao's affection, he notes that I have a door to my office. Like I said - tougher than me. The only thing that allows me to get anything done - and I mean anything - is that cats sleep sixteen hours a day. 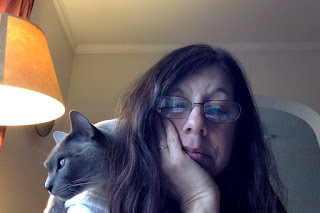 Once he's really sleepy, he's willing to doze on the bed or the couch, especially if I've got a fire going in the wood stove - until mid-afternoon and close to his dinner time - when he has a tendency to climb onto the keyboard. He's incredibly annoying...and I adore him. Most likely, though, he'll never be in one of my espionage thrillers, because then I might feel obligated to kill him. And I can't bring myself to kill an animal in a book. I can write scenes in which my protagonist is horribly tortured, a man with a pregnant wife is shot, a lovely young woman is impaled, but kill an animal? Can't do it. I hate books or movies where animals are killed. I have been known to consult the website, Does the Dog Die?, before agreeing on an evening's entertainment. I get previews of Game of Thrones from my family so I know to rush from the room just before the inevitable happens, because George R.R. Martin or the show's producers do not shrink at killing anyone or anything. I was more upset at the death of the dire wolf at the Red Wedding than the murder of multiple members of the Stark family. This gets back to why I don't feel I can put Xiao in one of my novels. Cozy mysteries often feature cats or dogs, and the cats and dogs are never harmed. It's a different genre and goes for a different effect. In an espionage thriller, everyone and everything has to be at risk. Nothing increases the villainy of the bad guys more than the deaths -or possible deaths - of innocents. Nothing gets our emotions more engaged. The writer has to be willing to at least consider killing any character - except the protagonist in a continuing series - to increase suspense and the overall atmosphere of danger. That includes cats and dogs. There's the trope about Chekhov's gun that every writer knows. According to Chekhov, don't put a loaded gun in a story unless you intend to use it. Think of the cat as the loaded gun. You put a cat in a novel - and you have to find the most effective way to use the cat to move the story forward. In a thriller, doesn't that mean killing the cat? On the other hand, the skilled writer who knows the rule about Chekhov's gun can feel free to break the rule. Breaking rules sometimes works better than following the rules. Maybe the cat doesn't have to die. Maybe the cat can be used to humanize the villain or even the protagonist. Maybe risk to the cat can raise the tension level and then the reader can be relieved when the cat survives. pawing at the keyboard. I can either feed him early, which means he's hungry earlier tomorrow morning, or I have to fend him off for another sixty minutes. Then, again, I could kill the cat. Of course I know you won't ever kill the cat, S. Lee -- how terribly attached we get to animals, even though they "demand" our attention. When I watch our puppy carefully placing a ball at my feet and then looking up with a wishful stare, it kind of reminds me of a 4-year old ballerina in a tutu calling out "Look at me" -- and we always do. Great post about a great cat! Thanks. What a wonderful cat, and annoying, S. Lee! I adore Xiao already, and I'm so glad you're his cat mommy because he will live a long and happy time. Such a personality! Yes, please don't kill the cat! Great blog! I hate when authors kill pets. Never kill the animal! Learned that from Wendy Corsi Staub when on book tour with her (which was a blast by the way). Love the picture of Xiao! Kidding aside, I could never kill an animal in a book. Xiao is mugging for the camera. Thank you, Karna, Gayle, and Jamie. Jamie gives good advice, so your basic instinct is dead on, S. Lee. Great picture of you and the Xiao. Great name for a cat, by the way.